Every responsible owner knows the importance of looking after their horse’s feet. 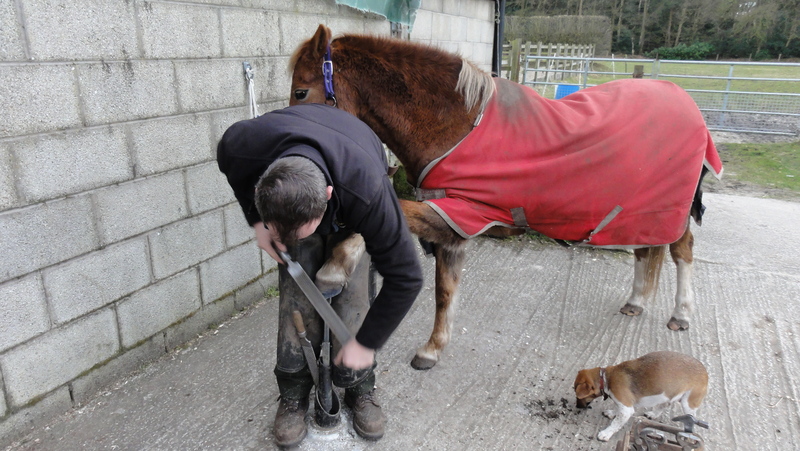 The old saying ‘no foot no horse’ is as true today as ever, and if your horse has poor, weak or problem feet then you’ll appreciate just how skilful a farrier has to be to keep the hoof sound and balanced. Jeremy Taylor has been a self-employed farrier for 15 years, and took a few minutes out between horses to talk to me about his professional life. Q. What training do you have to do to become a farrier? A. Farriery is one of the few professions where you still have to serve an apprenticeship, which lasts for four years. As there’s keen competition for places, many aspiring students also choose to do a pre-farriery course, to learn about anatomy and get a good grounding before applying for an apprenticeship. Most farriers also insist on a six month probationary period before the apprenticeship starts formally. You have to attend college for four – six weeks every year, and take two exams each year. If you fail either of these, you drop back six months for re-training. At the end of the apprenticeship, you take your finals – a two and a half hour written paper, an interview with a vet, presentation of various surgical shoes you’ve made yourself and an interview with two qualified farriers. The whole training process takes around five years, and finally, if you pass, you receive your diploma and are admitted to the Worshipful Company of Farriers, which is our governing body. All farriers need to be registered, and, in fact, to take money for hot-shoeing a horse without being registered is illegal. Q. How many horses do you see a day? A. Around six or seven, all over Cheshire. Q. What do you look for in a healthy foot? A. Good growth, and a balanced foot with good weight-bearing ability. If you were to cut the hoof in half vertically down the front, both halves should be equal. Of course, horses are individuals and most have a dominant side, just as humans are left or right-handed. The foot on the dominant side tends to be bigger and more developed, so most horses have front and back feet that aren’t a perfect pair. When trimming the feet, I try to pair them up as nearly as possible, and promote growth without weakening the foot. Q. Do you make any of your own shoes? A. With most horses, I can buy a standard off-the-shelf shoe and tailor it to fit. If I need a non-standard size or type of shoe, though, I’ll make it myself. All farriers know how to make a full range of shoes, and it’s good to keep that experience alive. In fact, you can’t fit a factory shoe without knowing how it’s made, it’s all part of the job. The most unusual types of shoe I fit are probably glue-on plastic shoes for laminitics, and heart bars for horses with navicular. Q. How often do you like to see a horse? A. I always try to see a horse every five to seven weeks, depending on the individual horse, the type of work it’s doing and the season. 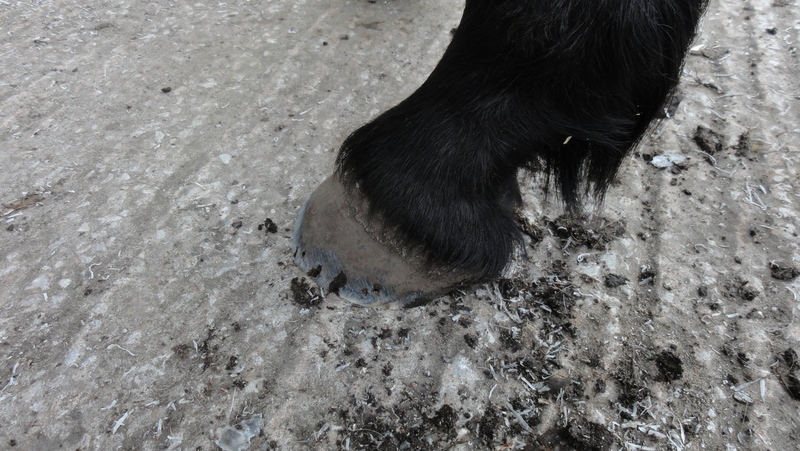 The hoof/pastern axis of a horse’s leg should always be a straight line, so if you were to take a ruler and lay it against the pastern the wall of the hoof should follow the same line. If the foot isn’t trimmed regularly, the toes will soon grow and push the axis out of true, forcing the horse back on its heels and potentially damaging the joints and tendons. Letting your horse go too long between trims is a false economy, as it’ll cost more to sort the damage out afterwards! Q. What’s the best thing about your job? I’ve been working on my own for 15 years, and I’m still seeing clients and horses that have been with me from the beginning. I love the challenges the job can present, as well – I like working with a less-than-perfect hoof and seeing the difference I can make. I like working outdoors, as well, and chatting to the customers. Q. And the worst thing? Probably the physical demands of the job. All farriers have back or knee problems at some point in their lives! Although I love being self-employed, it can be problematic as there’s always the chance of injury when you’re working with horses. I’ve been very fortunate, as I’ve only ever had one accident and that was when I was serving my apprenticeship – I was kicked in the face by a little Welsh mare who had a foal with her. Fortunately she wasn’t wearing shoes, or there’d have been a lot more damage – as it was, I cracked four teeth and had to have them repaired. I was left with a large dental bill which I had to pay myself. As a direct result of my case, the laws were changed to give apprentices more financial protection. Q. What equipment do you carry in the van? A. These days, farriers carry portable forges powered by propane. The van’s also equipped with racking for storing shoes and other supplies. I also carry a full range of tools. I have to be careful not to carry too many supplies, as it makes the van too heavy, so sometimes it takes a bit of planning! Q. What insurance do you carry? A. Due to the fact that we’re carrying propane on the vehicle, a lot of insurance companies won’t insure farriers, but there are several specialist companies we can use. In addition to the van insurance, I also carry public liability cover and my own health insurance. Q. In most other equestrian jobs, women tend to predominate. Why aren’t there more women farriers? A. Women are still in the minority, and that’s just down to the physical demands of the job. There’s no difference from a skill point of view, but farriery is very hard on the back and muscles. We are seeing more women than before though, so who knows what’ll happen in the future.